If I build it they will come, Mike Komar would say when he got the Idea to build a golf course six years ago. A golfer himself, he was fed up with the difficulty In getting T off times locally and with the quality of some of the local courses in comparison to those he had seen even in such remote locations such as Sioux Lookout, Ontario. He started to build his dream on the ten acres of land that he owned at the corner of Onion Lake and Melbourne Roads in Thunder Bay knowing that the surrounding land would soon become available. In a process that Mike recalls as just a fog he set out to build his dream golf course. The land was cleared and holes were built on a yearly basis. Along the way, the course operated as an executive 3-hole course, then a 5-hole course and began to develop a loyal following. Mike knew that the land was well suited for this venture as it contained numerous ponds, a lake and many variations in elevation. Many of the ponds were spring fed and since the water table was so high, he could create ponds with little work. Mike secured the services of Grant Golf, a golf course design firm that had actually been involved in the construction of the course that had spurred his imagination in Sioux Lookout. David Grant and Mike worked very closely together for years, both sharing the dream to build a course that took advantage of the natural beauty of the land. The natural beauty of the land truly remains as the mature trees were hand-picked instead of clear-cutting and planting. The course has greens that challenge even the country clubs, rolling hills, 10 ponds, 2 lakes, waterfowl, deer and moose, When standing atop the highest elevation (the forth T box), you are greeted with the most magnificent view of the Sleeping Giant, Mount McKay and Lake Superior. The first three holes are long, which allows the course to move quickly. The second hole is a par 4 which requires a 235 yard precise shot to carry the creek, If you chose to lay up, you still have a 200 yard shot to an elevated hourglass shaped green. The 7th holes T box is on top of a hill, you must clear a lake and meet the challenge of a. dog leg left before your bail finds the green. 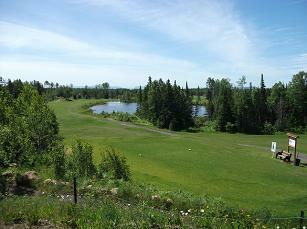 Each hole has unique qualities, most have water and all have large T boxes (blue, white and red) and large greens (which have been called the best in Northwestern Ontario). Reminders of the past remain, such as a huge barn, a dug-out cellar and old farm equipment, as the land had been used for farming for generations. Over the last two years (the time that we have been operating as a 9 hole course), we have managed to attract a loyal following including a very strong and ever-growing mens club. They meet each Monday and Thursday evenings to golf, eat together and enjoy one anothers company. There are many fun nights and tournaments arranged throughout the year culminating in an end-of-year tournament. Originally, the course was called Komar Greens, but when it finally reached Its status of a nine-hole course, the owners felt that it was time that it became Its own entity. They named it Dragon Hills as the course has many elevations such as the points on a dragons back and a very challenging nature.